It’s a turkey. It’s a cheeseball. It’s a turkey cheeseball!! I know that most people bring luxurious, time-consuming, warm and inviting dishes to Thanksgiving. What do I bring? This turkey cheeseball!! It’s cute and kitchy and it’s kind of fun to see my family’s reactions to it every year. 2018 marks nine years that this deliciousness has graced our appetizer table at Thanksgiving! Nine. It’s a hit, people. I found this recipe somewhere on the interwebs long before Pinterest was even a thing. I have adapted it to my taste over the years, but kept with the same basic concept; the original recipe is from Taste of Home. I have said this before in my other posts, but I am not a fancy cook or chef. I am just a regular gal with a passion for helping others eat gluten-free foods and not feel deprived. After I took some photos of the recipe, my kids sat down at the table and dug in!! They have very few foods that they love: fruit, Costco hot dogs, ice cream. You get the idea. This cheeseball must be tasty if my kids are eating it! What makes this cheeseball special, you ask? It has little bits of smoked turkey, yummy umami flavor from worcestershire sauce (Lea and Perrins is a good gluten-free one), and lots of sharp cheddar cheese. You’ll see that my recipe calls for a bit of spreadable cheese dip. I like to use the sharp cheddar or port wine flavor from Kaukana. You can decorate the turkey however you want. You can add a few rows of pecan halves as feathers. And if you’re feeling adventurous you could even dye some cream cheese and then decorate crackers to make them look like feathers. 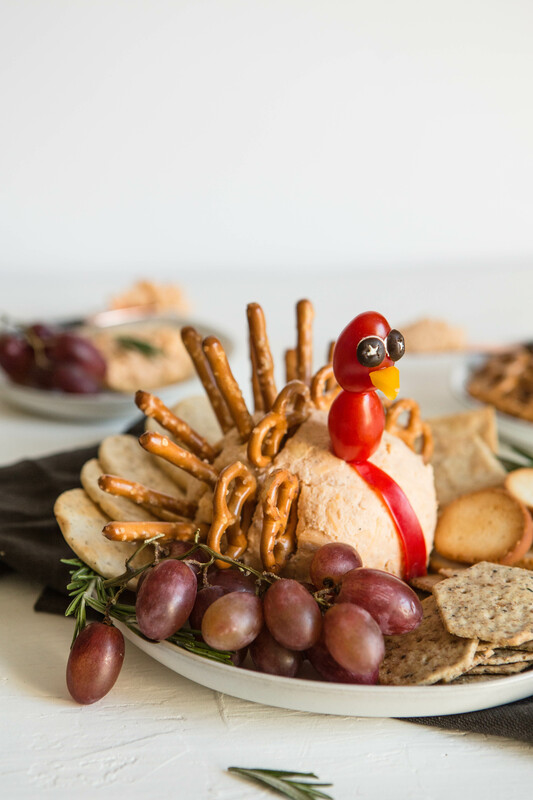 Actually, that’s what I did when I first started making this, but I quickly realized that was WAY too time-consuming for me and the pretzels look just as cute! To make the turkey’s head, I stuck a couple of grape tomatoes on a skewer (and then broke it off to fit the size of the cheeseball). To make the eyes you can take a couple dobs of cream cheese and place black peppercorns in the center. This time I used some cut-up black olives. For the beak, I cut a small piece of yellow bell pepper into a triangle shape and stuck a toothpick in it to then place in the top cherry tomato. What I call the “gobbler” is made from thinly sliced red pepper. I flipped it over and scraped some of the “meat” off to make it thin and pliable. Apparently, the technical term for the skin that hangs from the side of the beak is a “snood”. You learn something new everyday! It's a turkey. It's a cheesball. 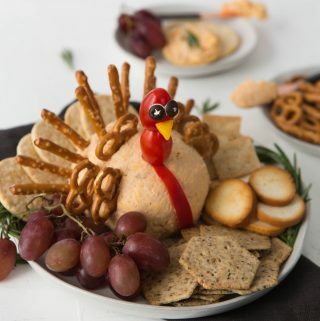 It's a turkey cheeseball!! You'll be the hit of the Thanksgiving gathering this year when you bring this darling appetizer. Add all ingredients to a stand mixer and beat until well-combined. Place plastic wrap (like Saran Wrap) in the bottom of a small round bowl. Make sure the plastic wrap is large enough to place around the entire cheeseball. Put the cream cheese mixture into the bowl and wrap the plastic wrap around the top. Shape it into a round ball with your hands while you're doing this. Place in the refrigerator overnight(or about 12 hours). This will help all of the flavors meld together. 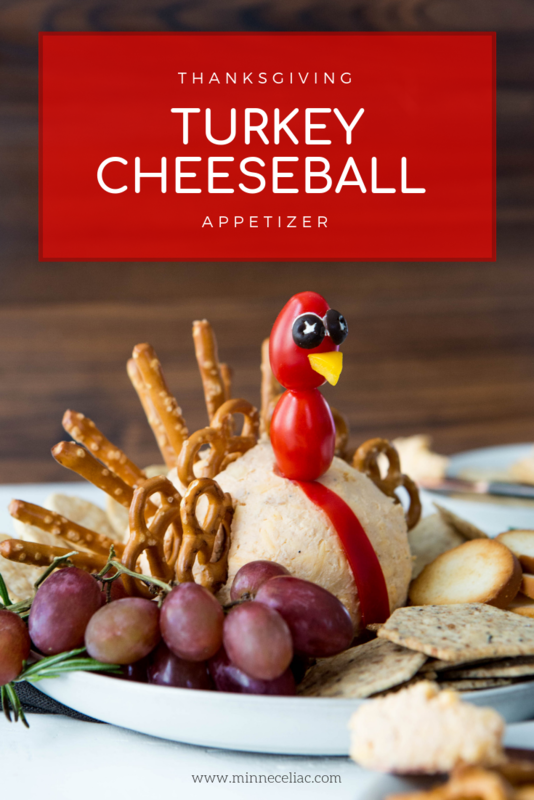 When ready to serve, remove entire cheeseball (still wrapped) from the bowl and form it into a uniformly shaped ball with your hands. Remove from plastic wrap and place on a serving platter. You can use a small knife to smooth out any imperfections. 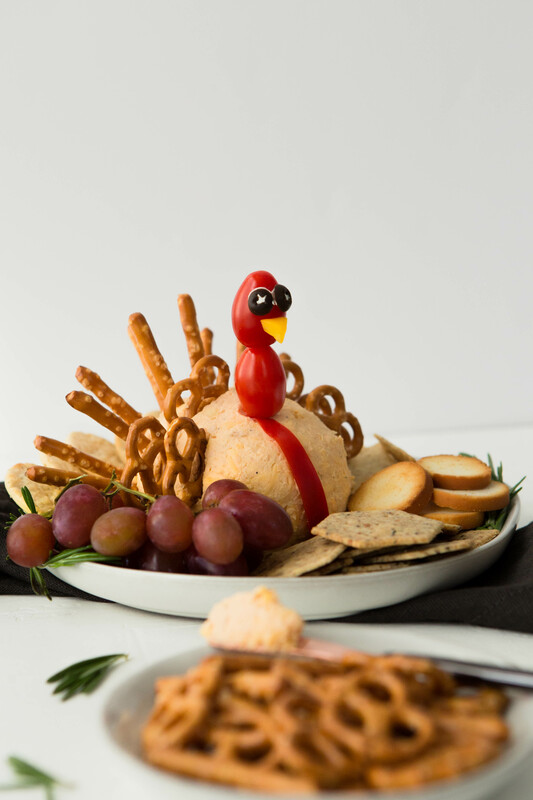 Place the pretzels in the back of the cheeseball in a fan shape to make it look like the turkey feathers. I like to use the twists in the front couple of rows and the sticks in the back couple rows. Serve with your favorite crackers, bagel chips, pretzels, pita bread, or veggies, all gluten-free of course! There are so many cracker/chip options out there now for us gluten-free folks. I like to give people a variety so I always gets lots of different kinds to spread around the platter. First off, my absolute favorite pretzels are Snyder’s of Hanover gluten-free pretzels and not a single person has been able to tell the difference from the regular ones. I also like the bagel chips from Glutino. All of the flavors of Simple Mills crackers are some of my absolute favorites and they hold up really well. This year I might even make some Chebe breadsticks. So many options!! You can also make this into a charcuterie board and add some nuts, olives, dried fruits, or baguette pieces. Be creative with this and make it your own! You can PIN this recipe by clicking on the photo below. Happy Thanksiving, everyone! Gobble, gobble.